It took us two years – and steady collaboration with the author – to translate the nuts and bolts of Douwe Tiemersma’s book Non-Dualiteit, de grondeloze openheid into English. You know, we just wanted to understand what he was actually saying(!). It took another year of judicious editing to arrive at a manuscript that was attractive to a publisher. Last November we were lucky enough to sign a contract with John Hunt Publishing. They plan to publish it soon under their Mantra imprint. In these intervening months I have done another round or two of author editing after also reviewing the publisher’s copy editing. Now the manuscript has been finalized and real production begins. Though it is hard to predict when it might actually hit the streets, six months from now is a reasonable guess. Luckily the publisher will handle all the marketing and distribution (efforts and costs) – and yes, when the time comes for it, the book should be available on Amazon. Look for it, read it and write a review if you find yourself inspired to do so. Picture yourself biking through the beautiful coastal countryside of West Vlaanderen this summer, visiting the picturesque villages of Zuinenkerke, Meetkerke, Houthave and Nieumunster. Sounds nice, yes? But then picture yourself enjoying not only the rural scenery, but also discovering the work of 25 contemporary artists whose work will be displayed en route. Sounds even better, right? 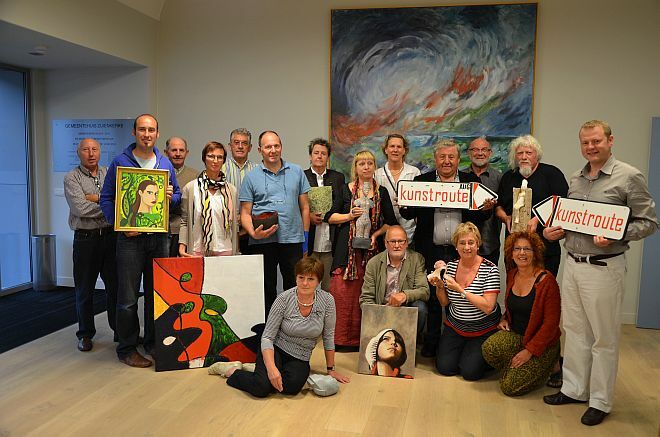 It’s the 14th edition of the Kunstroute Zuienkerke. Grab your bike and on August 13, 14, 15 and/or 20, 21 between 11:00 and 19:00 plan on traversing the 25 km route in style. Download the folder front and back to view the complete list of participating artists and venues. Entrance is free. In conjunction with the Kunstroute I’ll be exhibiting a number of drawings and watercolors in the Herberg Drie Koningen for the whole month of August. The Herberg is open from 11:30 Thursdays – Sundays. Please consider yourself welcome! Yes, it’s true, it’s official. I am now a published author! Sure, writing to your own blog can be a form of self-mandated soap boxing, but now two different and independent online publications have each published one of my essays. The first (chronologically) is PSYART, on online journal dedicated to a psychological study of the arts. You can find the journal here. I’m currently listed in the top left place on the home page, next to a short abstract on the right describing the contents of the essay. You can click on the title, “The non-duality of self-expression” to read the full article. The second publication is Non Duality Magazine, a non-profit online journal dedicated to an ongoing investigation into self-realization, awakening and consciousness itself. My article has been included in the Art section of volume 4. 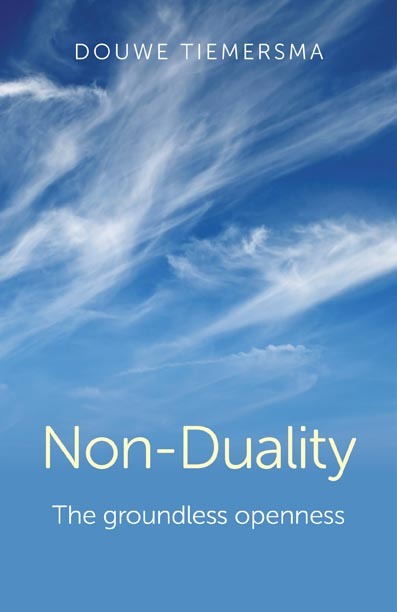 I find Non-Duality Magazine to be a very clean and clear representative of the the depth and breadth possibilities available within the realm of self-investigation. I highly recommend surfing through the current issue as well as all three previous volumes. My essay occurred in its original form as a blog post about a year ago, arising from a combination of at least two elements that I’m aware of: my translation activities on a book about Non-Duality (we’re currently looking for a publisher for the completed manuscript so – hopefully – more to come on that soon) and a painting I was working on at that time. That original post has now been updated to reflect the most recently revised version so that those who wish to comment on the article can easily do so. All comments are welcome! Almost 1,000 visitors in the eight day time period (and I only counted the people who stayed long enough to actually look, not the heel-turners), so the location is great for exposure. A few painting sales, enough to cover our expenses, but otherwise no great windfall. The greeting cards were, of course, more popular, but still not enough interest (yet) to justify an offset print run. Lots of positive feedback. My visitor’s book is loaded with compliments. Many visitors left with my contact info so exposition related sales are still quite possible. I won’t say likely ’cause I really don’t know. What to make of it? The economy here in Europe is in a greater slump than it was even one year ago – and of course the art market is, as ever, one of the most sensitive areas (this collaborated by a Dutch gallery owner). The Belgian contemporary art market principally respects/honors only abstract art. There is not one gallery in the whole country that specializes in offering contemporary realism (! 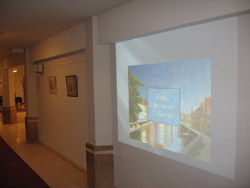 ), while I have already located three high end contemporary realism galleries in the Netherlands. In the UK, too, anything goes. Thus, I intend to include marketing my work to a wider audience. 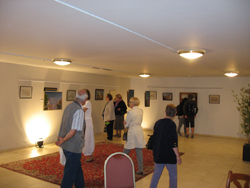 During the exhibition, there was a city wide Lace-Festival. So, many visitors during the latter part of the week were people who had been practicing that craft for a number of years. Such humble visitors invariably preferred the monochromatic, detailed drawing/value studies. They could appreciate the time involved to achieve a beautiful, colorless simplicity.